Fresh Orchids in Vase with Assorted Cadburys Chocolate. Fresh Orchids in Vase with Balloons, Teddy. 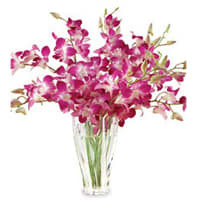 Fresh Orchids in Vase with 500grms Assorted Sweets. Fresh Orchids in Vase with 16 pcs Ferrero Rocher chocolate box.